The British Franchise Exhibition is an event where those interested in Franchising can explore a huge range of franchise brands, choose between 40 free seminars, be inspired by real life franchising stories, visit workshops and even better, visit Personal Career Management at our Careers Clinic for some professional careers advice. 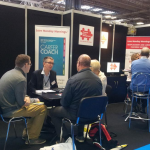 We have been working alongside Venture Marketing for the past 6 years providing the Career Advice Clinic at all the British Franchise Exhibitions across the country including; London, Birmingham and Manchester. All visitors to the exhibition can come and visit us at our stand and receive a 15 minute mini career coaching session where we offer strategic insights, guidance and career planning services. We can help visitors to formulate a career action plan, avoid the pitfalls and identify opportunities that match their skill set. Our next event is in June in Manchester which we expect to busy once again as more and more business professionals are looking at moving away from employment into self-employment or franchising.